Everywhere in the world seems to have a sale going on at the minute and i must say i have spent a few pennies picking up some fab bargains! Ive said it before but i will say it again, I like shopping online way more than i do in store and i will be found everyday browsing for fashion and beauty online. A website that i have bookmarked and search through frequently is Cruise Fashion. They sell products from designers and brands that i absolutely love such as Vivienne Westwood, Jimmy Choo and Marc By Marc Jacobs that is sometimes quite difficult to track down in the UK. 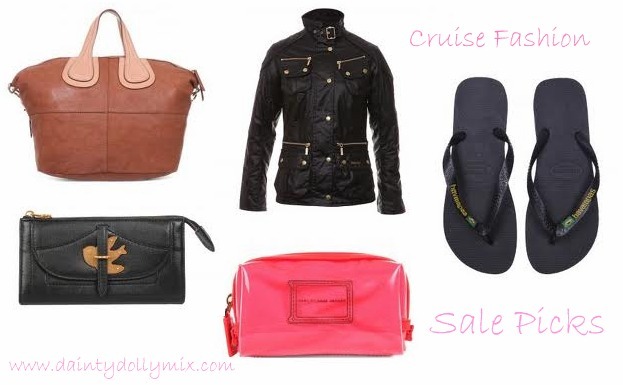 Their sale at the minute is pretty amazing so i put together my top picks from the sale. I really do think this bag is stunning. It is so simple yet so beautiful and £696 down from £1160 it has nearly £500 off! If i hadnt just treated myself to a Vivienne Westwood handbag this really would be in my basket. It looks the perfect size and i love the short handle so you can fling it over your arm. Is it a clutch/is it a purse? Who knows but this is gorgeous and multi-functional as i am sure you can use it for both! I am in need of a new purse (when i say need its more of a want!) and i am always on the look out for Marc By Marc Jacobs ones! This one fits the bill perfectly! I do love the gold bird on the front and at £120 down from £200 the price isnt too shabby either! As much as i would love to say its summer in the UK the weather at the minute is actually showing otherwise. It is dire and i really am in the need of a new coat. I think this Barbour Jacket is lovely and i think the gold zips and detailing really go well with the waxy look of the jacket. At £149 it truly is a bargain especially when the starting price was £299! Even though i own literally dozens of them, Make up bags are one thing i can never stop myself from buying - they are just so pretty! I love this Marc by Marc Jacobs bright coral jelly looking one! Its £39 down from £65 so a good deal compared to the original price! One minute we are talking about coats, the next flip flops! I know the weather is utterly poor in the UK at the moment but i am actually going to the sunshine state next month and have always loved Haviannas. These are £16 down from £20 so not the biggest saving in the world but every little helps and all that! These are plain black so simple but will go with everything! Have you been shopping the sales? Are there any other stores/shops you would like me to do this kind of post on? really love the look of the make up bag! Balmi Lip Balms - EOS Lip Balm Dupe?